Red Hat® Cloud Suite has everything you need to deploy an enterprise cloud and be productive once you get there. It includes an open source operating system, virtualization tools, a private cloud platform, public cloud interoperability, a containerized app-development platform, and our unified management system. QUESTION: What is Red Hat Cloud Suite? ANSWER: Red Hat Cloud Suite is an integrated combination of Red Hat open source software, including a container-based application development platform and a massively scalable cloud infrastructure with a unified management framework. With Red Hat Cloud Suite, customers can move existing workloads to scale-out cloud infrastructure and accelerate new cloud-based services for private cloud and application development. Also, the operations team can deliver public cloud-like services to developers and the business while maintaining control and visibility. QUESTION: What Red Hat products does Red Hat Cloud Suite contain? ANSWER: Red Hat Cloud Suite helps customers build a private cloud based on either Red Hat OpenStack® Platform, with public cloud-like scalability, or Red Hat Virtualization, with high-performance virtualization. Both choices provide scalable foundations for hosting Red Hat OpenShift® Container Platform. OpenShift Container Platform automates the development and administration of container-based applications. This combination of infrastructure and application development is seamlessly administered by a unified, single management framework offered by Red Hat CloudForms®, and complemented by powerful life-cycle management from Red Hat Satellite. The solution also uses a Software-as-a-Service (SaaS)-based risk management tool, Red Hat Insights, to collect infrastructure analytics, helping customers quickly and proactively manage technical risks before they impact operations. Red Hat Cloud Suite users can also separately purchase subscriptions of Red Hat Ceph® Storage and Red Hat OpenShift Container Storage to efficiently address the storage needs of the solution. QUESTION: How does the solution work? ANSWER: Red Hat Cloud Suite provides a common interface and technology stack for operations, IT administrators, developers, and lines of business. The suite includes a management framework across application development and infrastructure layers, along with complete operation and lifecycle management, providing massive infrastructure scale for innovation. Developers use Red Hat Cloud Suite to gain rapid access to compute power and continuously integrate and deploy applications across a broad mix of languages and frameworks. Operators use the solution to simultaneously monitor and govern these services and applications—from development through production. Chief information officers (CIOs) are better able to align with business requirements, helping them meet market and customer needs. QUESTION: What value does Red Hat Cloud Suite provide? ANSWER: With Red Hat Cloud Suite, organizations can more efficiently deliver the applications and insights the business needs, while maintaining governance and security. Red Hat Cloud Suite helps customers move toward cloud-native workloads without having to replace existing infrastructure. As with all Red Hat products, Red Hat Cloud Suite is based completely on open source software and is integrated via standard application programming interfaces (APIs). QUESTION: What are common customer scenarios or use cases? ANSWER: Red Hat Cloud Suite helps customers at many different levels. For customers wanting to optimize existing infrastructure, the suite allows them to build an OpenStack® private cloud environment that is easier to manage. The suite also helps customers to deploy and modernize applications. Using Red Hat OpenShift Container Platform, customers can accelerate application development, testing, containerization, and deployment with a variety of frameworks and languages. Red Hat Cloud Suite also provides unified, heterogeneous management through Red Hat CloudForms—across different virtualization estates and private clouds, as well as the application development platform. Red Hat CloudForms also gives customers workload portability with firm governance and control. QUESTION: How is Red Hat Cloud Suite different from other competitive offerings? ANSWER: Red Hat Cloud Suite is a completely open solution that combines virtualization, private cloud-public cloud interoperability, and application development with a common management framework. It provides public cloud-like scale with Red Hat OpenStack Platform, flexible and open container-based application development with Red Hat OpenShift Container Platform, and hybrid cloud management with Red Hat CloudForms. Open innovation provides a well-integrated, enterprise solution at a reduced cost. Integrated suite. Tightly integrated, fully supported components act in concert to provide an open hybrid cloud. Unified management. Single management framework across infrastructure and application development layers, along with complete operation and life-cycle management. Full-featured application development and containers. Flexible, container-based application development with Red Hat OpenShift. Open API exposure. Customers can enhance or replace existing components with their choice of existing technologies, with no vendor lock-in or proprietary technology. Massive ecosystem. Easy-to-add networking and storage, Red Hat and third-party products and cloud solutions, broad independent hardware vendor (IHV) interoperability, and public cloud provider support. QUESTION: What is the difference between Red Hat Cloud Infrastructure and Red Hat Cloud Suite? ANSWER: Red Hat Cloud Infrastructure helps customers build and manage a private Infrastructure-as-a-Service (IaaS) cloud based on datacenter virtualization and management technologies for traditional workloads. It also provides an introduction to a highly scalable, public cloud-like infrastructure based on Red Hat OpenStack Platform. Unlike Red Hat Cloud Suite, however, it does not provide Platform-as-a-Service (PaaS) or Container-as-a-Service (CaaS) functionality. 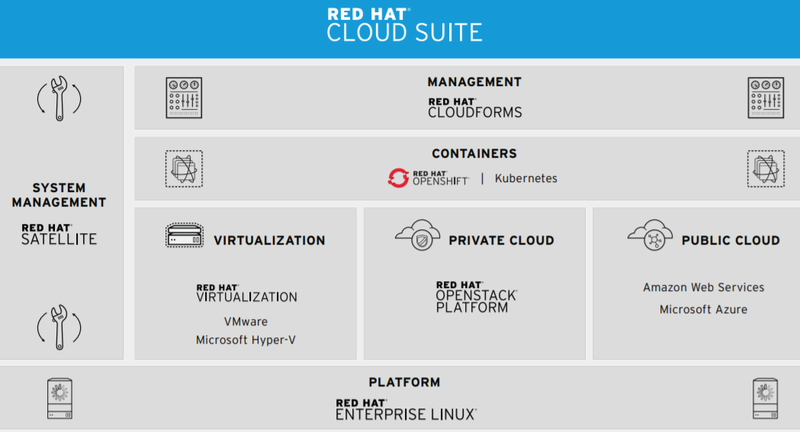 Red Hat Cloud Suite includes all of the infrastructure and management technologies existing in Red Hat Cloud Infrastructure, as well as Red Hat OpenShift Container Platform. QUESTION: How does Red Hat Cloud Suite fit a customer’s evolution to an open hybrid cloud environment? ANSWER: Red Hat Cloud Suite meets customers where they are in their cloud journey. Customers can optimize their existing IT and build new cloud services for infrastructure and applications with an integrated solution that includes a common management platform across this hybrid IT environment. Red Hat Cloud Suite also works seamlessly with a portfolio of other Red Hat and third-party solutions so that customers can build true hybrid cloud environments across private and public domains as they establish their software-defined datacenter. QUESTION: Are consulting engagements available for Red Hat Cloud Suite? ANSWER: Red Hat Consulting offers several engagements, including: Red Hat Consulting discovery session: cloud strategy, Red Hat Consulting assessment: Infrastructure-as-a-Service, and Red Hat Consulting: cloud migrations. Custom engagements tailored for specific customer needs are also available. To learn more, visit redhat.com/consulting. QUESTION: Is training available for Red Hat Cloud Suite components? ANSWER: Red Hat offers global, hands-on, technical training on all of the Red Hat Cloud Suite components. Students can train in a traditional classroom, online, or as part of a private team experience. We also offer the Red Hat Learning Subscription, a yearly all-access pass to our entire curriculum of online courses. To validate professionals skills, we also offer performance-based exams on many of the components. Our curriculum expands frequently—visit redhat.com/training for the latest offerings. QUESTION: How is Red Hat Cloud Suite priced? ANSWER: Red Hat Cloud Suite subscription pricing is based on the number of socket pairs in each server that hosts virtual machines (VMs). Each of these socket pairs requires one subscription of Red Hat Cloud Suite. Like all Red Hat offerings, there are no costly, upfront license costs. Instead, there is an annual subscription based on the level of support you need. The Red Hat Cloud Suite subscription includes product access, technical support, software updates, hardware and software certifications, and open source software assurance from Red Hat. Red Hat Cloud Suite subscription pricing is available with premium or standard support. In North America, a premium subscription costs US$30,000 per socket pair, while a standard subscription costs US$20,000 per socket pair. QUESTION: How do I learn more? ANSWER: Visit us at redhat.com/en/technologies/cloud-computing/cloud-suite or contact your Red Hat sales representative.